I’ve been using knives for years – as a fisherman, as a chef and as a woodworker. When I studied to be a shipwright, there was a certain level of pride and ownership that went with keeping your tools clean. Wet grinders, stones, strops… you could shave your arm with my planer blade. I had never learned to sharpen my knives from someone with experience but rather bought a stone and figured it out intuitively. So, when my stone developed a chip in it and I found the Bernal Cutlery website, I was excited to watch someone with experience sharpen it and mine them for tips and techniques. 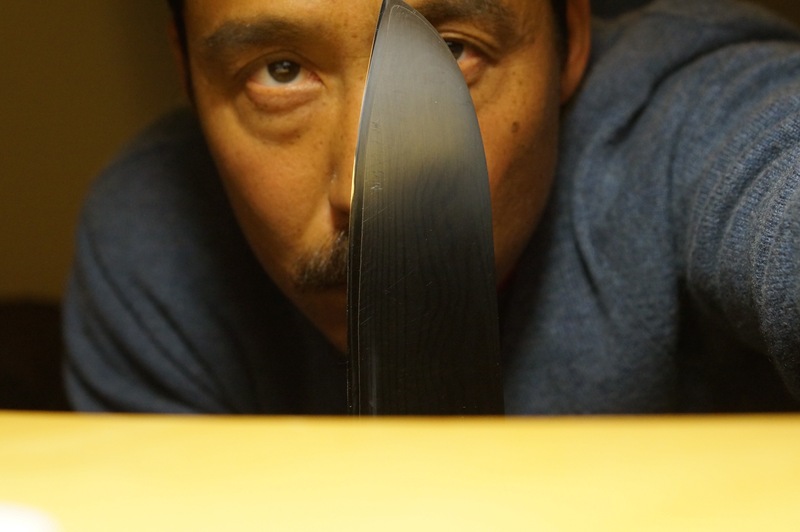 Bernal Cutlery uses traditional Japanese whetstones to hone your blade. I’ve always been attracted to Japanese handtools and chef knives. My kit includes many Japanese knives. Craftsmanship, the quality of the steel – the Japanese have it dialed. So, when I found out that this wasn’t going to be some guy in suspenders throwing sparks with a grinder wheel, I knew that Bernal Cutlery was going to be my kind of place. The thing with Bernal Cutlery is that they are not in Bernal. They are in the Mission. Ha. It’s a specialty store. Knives. And there are a lot of them in there. There’s also a lot of knife dorks talking about knives. SF is a chef’s town and this is where some of them hang out and drool over tools. I handed my knife over kind of sheepishly. On the duller side of what I was used to and a little bit embarrassed about the angle of the bevel. It’s always fun to watch someone who is good at their job. With deft strokes and a careful eye, the edge of my blade was brought back to a razor sharpness. The bead bent back and forth on the strop until it was pulled away with a flick of the wrist and all was left was a sharp, razor edge. Tak was generous with how he answered my questions about technique. Why he switched hands rather than draw the knife backwards on the stone. How I could use newspaper for a strop, if I was lacking a piece of leather sealed in compound. If you have any curiosity about knives and want to learn how to sharpen them yourselves, swing by Bernal Cutlery, bring a couple of knives and just hang out to listen and watch. There’s a lot to be learned out there.